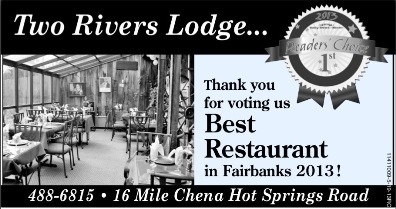 Since Territorial Days, Two Rivers Lodge has been providing Interior Alaska with the finest in gourmet cuisine. We are nestled in the spruce on the bank of a small lake just minutes out of Fairbanks. During the summer months enjoy your meal under the Mid-Night Sun in the Tuscan Gardens. Come to Two Rivers Lodge for that special event, or make any day special with our delicious food and our expert staff. Please be sure to call for our "Weekly Specials" or look us up on "Facebook"